Full House | I'm not stalking you. Criteria: I have to be able to watch it over and over again. * A great, but short-lived show. During my free cable trial, I am currently enjoying reruns of Full House immensely. So much so, that I might have to squeeze them into my top ten, possibly replacing Wonderfalls. The newest addition to this list is the FX show Terriers. I can almost guarantee you have never heard of it. Because I hadn’t either until a few months ago. When Once Upon A Time introduced a character named Neal Cassady (played by Michael Raymond-James), I was curious why the actor looked so familiar. A quick check of IMDb.com told me that I knew him from True Blood. This reminded me that I REALLY liked his character on that show. That is, until it was revealed he was the killer in the Season 1 finale. (In fact, I quit watching the show after Season 1–coincidence? Maybe not. I was still eager to know how Sookie was special–I mean, look at all the other supernatural elements she was attracting. But Entertainment Weekly eventually supplied me with the answer: Sookie is a fairy). 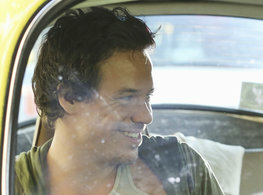 Michael Raymond-James doesn’t have your typical actor’s polished looks. With unruly hair and five o’clock shadow, he usually looks like he has just rolled out from under a rock. And it totally suits him! It is part of his charm, along with his gravely voice that sounds like he has been gargling nails. He is like a Shar Pei puppy you want to adopt (and take home). There is just something about him that I want to eat up! And I found out he is from Michigan–my home state! I like Raymond-James so much that I used his physical description as a basis for a character in a story I wrote (or two). He could have a part playing Satan, and I would still love him. Actually, that would be an AWESOME part for him! So then I looked to see what other shows I could watch the wonderful Michael Raymond-James in. That is when I went looking for Terriers on my streaming Netflix and found it (It must have been providential, because Netflix NEVER has what I am looking for!). Terriers was sooo good I ended up watching all 13 episodes in a week. It is a hard show to describe, but let me try. It reminds me of the old show The Rockford Files in tone and premise. Terriers is about two guys who act as unlicensed private investigators and solve cases, usually for average Joes. There is also an over-arching plot in the first (and only) season involving a millionaire and his nefarious plans for the whole community of Ocean Beach. It all sounds dark and seedy and it would be, except it takes place in sunny California. 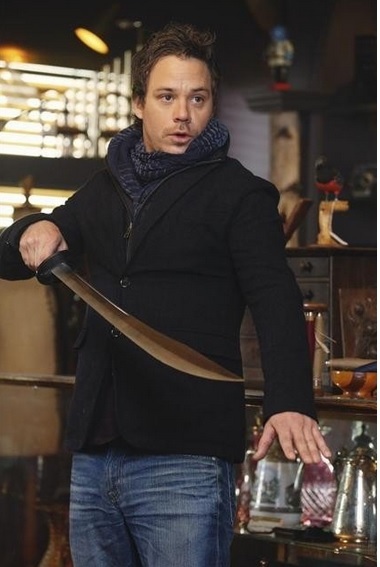 Michael Raymond-James plays Britt, sidekick to the charming Donal Logue, who you probably know from humorous roles on shows like Grounded for Life. Donal Logue is humorous at times on Terriers, but he also does dramatic very well as the disgraced police officer/recovering alcoholic Hank. I am not big on police/procedural type shows, but this one sucked me in. It has heart. It makes you care about all the characters. They are so real they jump out of the television screen and stick with you long after you have turned the TV off. You care about Hank’s issues with his ex-wife and sister who suffers from depression. You worry that at first Britt the rehabilitated criminal may not be good enough for his girlfriend, who is studying to be a vet. But by season’s end, the situation has flipped, and you see that in fact she is really not worthy of him. And there is a scene by Donal Logue that happens at a bank (he confesses an affair with the wife of the loan officer he is trying to get a loan from) that is so shocking, I do not believe I have fully recovered. The way we view TV these days has pros and cons. I am so sad that this show was cancelled by FX in 2011 after only one season. If I had known its brilliance then, I could have campaigned to try to save it. I am positive I am not the only one who will discover how brilliant this show is without ever knowing it existed during its normal run. The pros are that I have not had cable in my house for over eight years. If not for streaming Netflix, I would never have been able to find and enjoy Terriers at all. I wouldn’t have been able to add it to my Top Ten list. The theme “Gunfight Epiphany” wouldn’t have become one of my favorite songs. Now that WOULD have been a shame. Posted in Entertainment Worship & Review and tagged Donal Logue, Friends, Full House, FX, Growing Pains, Homefront, Laverne & Shirley, Michael Raymond-James, My So-Called Life, Once Upon A Time, Punky Brewster, television, Terriers, The O.C., True Blood, WKRP in Cincinnati, Wonderfalls. Bookmark the permalink.